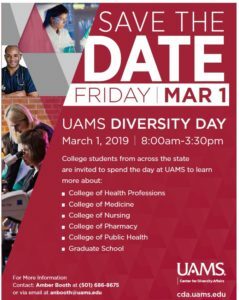 The University of Arkansas for Medical Sciences (UAMS) Center for Diversity Affairs (CDA) is hosting Diversity Day. The event is Friday, March 1, 2019. Diversity Day is designed to inform undergraduate students, college advisors, and anyone 18+ years old considering a job in a health profession about the variety of career options available on campus. Students and Advisors will be exposed to all five (5) UAMS colleges and graduate school. There is a plethora of information presented from admissions, to “Finding your Plan B Career Options”. During this conference-style event you will have opportunities to tour various clinical sites, participate in hands-on activities in the simulation center, and interactions with current UAMS health professional students. The event is COMPLETELY FREE, and we provide lunch. Representatives of students, faculty, and staff from each institution will be present The event is meant to give students/advisors a sense of life at the University of Arkansas for Medical Sciences as well as to celebrate and embrace students of diverse backgrounds. Each of our (6) institutions will be featured during our fun breakout sessions and tours. You will also hear about opportunities and scholarships available from Little Rock Army Medical Recruiting Station. Little Rock Army Medical Recruiting Station– Come meet health care recruiters from the Little Rock Army Medical Recruiting Station and learn how you can get your medical school paid in full. They will explain two scholarship programs — the Health Professions Scholarship Program (HPSP) and the Medical School Stipend Program (MSSP) — that can help you avoid the rising debts of medical school. Regional Programs (REP)– REP Information Session — Regional Programs provides support for undergraduate students as they are considering careers in healthcare and applying for professional school, including academic advising, MCAT prep, mock interviews, job shadowing, volunteer opportunities, and much more. Hear what all we have to offer then speak with a recruiter to find opportunities in your area. Come meet health care recruiters from the Little Rock Army Medical Recruiting Station and learn how you can get your medical school paid in full. They will explain two scholarship programs — the Health Professions Scholarship Program (HPSP) and the Medical School Stipend Program (MSSP) — that can help you avoid the rising debts of medical school. 400 students who are accepted or enrolled into accredited schools of medicine or osteopathy programs. The program provides full tuition, a monthly stipend of $2,330.78 (current rate) and reimbursement of certain academic fees (i.e. books). One of the great things about this opportunity is students do not have to wait until they have been accepted into a medical or dental school to apply for the scholarship. You attend the medical school of your choice, granted it is AMA accredited and located in the United States. After you graduate under this program, you will serve one year on active duty for each year of medical school you were on scholarship. In addition to the full tuition and monthly stipend, there is also a $20,000 bonus available for all scholarship recipients.